I had a batch of pumpkin puree in the freezer that I’d been looking for the perfect excuse to use. 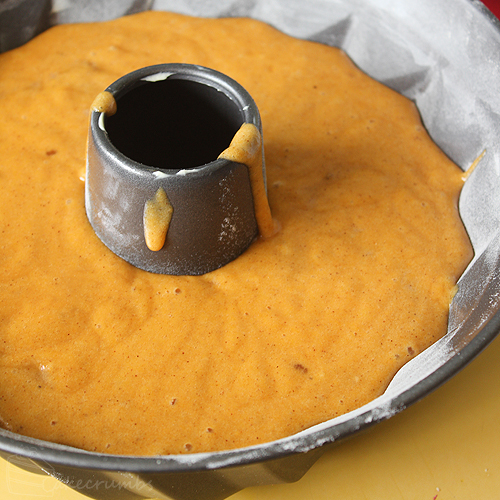 I quickly whipped up the cake batter before folding in the vibrant pumpkin. I spent so much time being fancy with the other cake I decided to make this one completely rustic. I did lament my lack of owning a really pretty bundt pan, but went with what I had. I popped this in the oven while I fluffed around with the more complex cake. By the time it was ready to come out of the oven, my house was full of aroma of pumpkin and spices. It smelled amazing. Cameron constantly hinted at getting a slice as soon as I’d turned it out of the tin. The cake was a massive hit. So much so that Cam’s mum asked me to make it again for her birthday a week later. It was upon revisiting it that I ran into a massive snag. I must have left the pumpkin puree defrosting on the counter top for far too long this time, because when I opened the container it smelled kinda weird. It wasn’t a terrible off smell but enough that I didn’t trust using it. 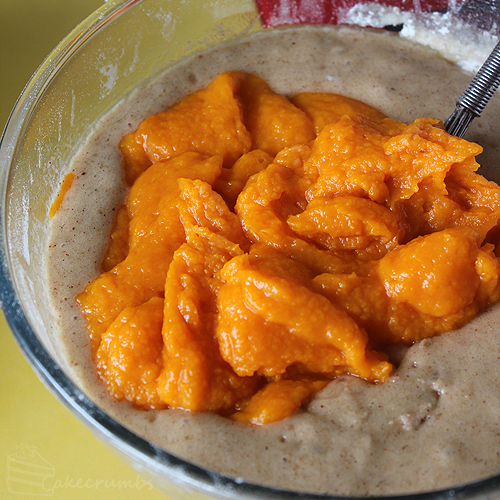 I had no time to run to the shops to get more pumpkin and that was my last batch of puree. So I scrambled around the house for other options. I started poking around my veggie drawer in my fridge and came across a heap of carrots. 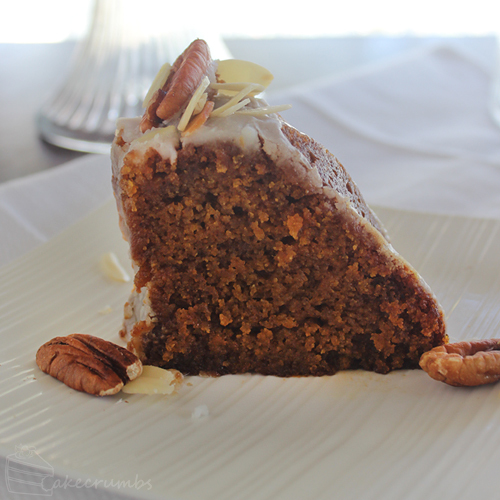 I’d substituted carrot for pumpkin in a tonne of other recipes, so why not this one? The carrot puree turned out to be a life saver. There were subtle differences between the two cakes, and in the carrot one you find the vegetable doesn’t break down as much so you get tiny flecks of orange carrot dispersed throughout it. Both were wonderful and enthusiastically demolished. To make the vegetable puree, cook vegetables until they are just tender. You can do this by roasting them, boiling them in a pot of water, steaming them over one, or heating them in a microwave. Strain the veggies if needed, then puree them using a food processor or stick blender. Place a sieve over a medium bowl; line with a paper towel. Transfer vegetable puree into sieve and leave it to sit until it cools to draw out excess moisture. Preheat oven to 180°C (160°C fan-forced/350°F). 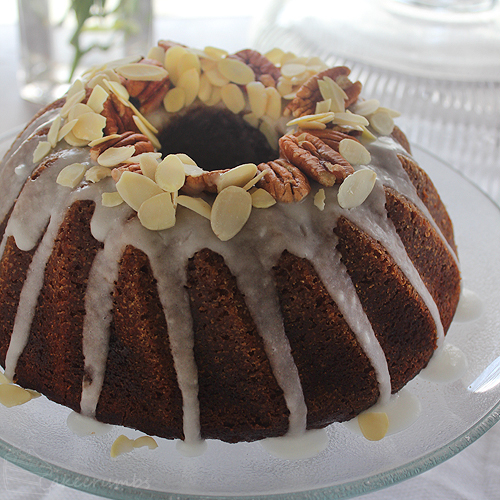 Grease a large bundt tin (with a non-dairy fat if baking this for non-dairy requirements) and coat lightly with flour. Combine liquid ingredients together with sugars in a large jug; whisk to combine. In a large bowl sift together the remaining dry ingredients. Make a well in the centre; add liquid ingredients. Gently stir in the flour until just combined. Fold in the cooled vegetable puree. Combine ingredients in a medium size bowl and whisk until combined well. 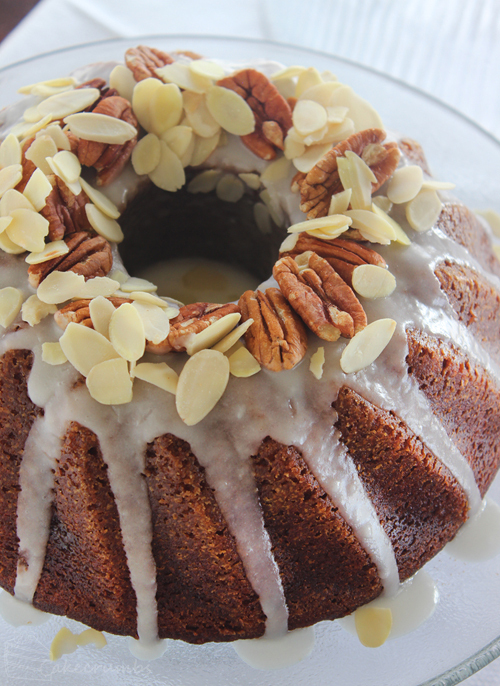 pour over the bundt cake. Top with nuts or any desired toppings. This sounds amazing! I’m going on a date with a vegan at the weekend, if it goes well I will wow him with this somewhere down the line!!! That’s exciting! I hope it all went well for you? Seeing this again now is making me want some more! I made this yesterday and it was delicious! very, very moist but had a lovely texture. First time I have ever made a cake that did not use eggs or butter so this was a positive experience. Thanks for the recipe. Absolutely my pleasure! I’m glad you enjoyed it. i have never seen such strange measurements in a cake recipe…why the ..2 oz? i am not sure how to go about figuring out why not round up or down? Because I live in a country that uses the metric system I am not familiar with measuring in ounces, so I use a straight and accurate conversion. The decimal points give an exact conversion from grams to ounces. If you wish to round the numbers that ball is completely in your court.